Alan Bennett has been one of England's leading dramatists since the success of Beyond the Fringe in the 1960s. His work includes the Talking Heads television series, and the stage plays Forty Years On, The Lady in the Van, A Question of Attribution, and The Madness of King George III. His recent play, The History Boys (now a major motion picture), won six Tony Awards, including best play, in 2006. In the same year his memoir, Untold Stories, was a number-one bestseller in the United Kingdom. Does your group meet regularly? If so, how do you think the Queen, as fountain of honor, would appraise your list of reading so far? The Queen says that she reads because, "One has a duty to find out what people are like." Yet she begins by reading Nancy Mitford and Ivy Compton-Burnett, hardly a stretch for Her Royal Majesty. How did you begin your reading career? Was it Anne of Green Gables or Barbara Cartland? What treasured books on your group's list closely reflect your own world and background? Do you read to understand others? Is anyone present at this meeting a member of the titled aristocracy? Early in The Uncommon Reader, the Queen explains that she has resisted reading because it is a hobby, and therefore an expression of a preference—preferences exclude people and are to be avoided. Why does she fear that reading will exclude people – haven't we been brought together today by reading? Is your reading group very exclusive? Have you ever denied membership to someone who wanted to join? "Herself part of the panoply of the world, why now was she intrigued by books, which, whatever else they might be, were just a reflection of the world or a version of it? Books? She had seen the real thing." Do you believe there is a difference between reading and experiencing? Isn't the act of reading a form of experience, or is that vein of thinking distinctly privileged? At first the Queen says that her purpose in reading is not primarily literary: it is for analysis and reflection. Why exactly do you read; is it a lofty endeavor or a fundamentally human one? What do you think of the Queen's values as a reader, for example her insistence upon reading a book all the way through to the end, regardless her level of engagement? Surely most of us would put a book down if within fifty pages it proved to be a tedious waste of time. Have you ever attempted to discuss a book you haven't read? Authors, the Queen decides, were probably best met within the pages of their novels, left to the imagination like their characters. Have you met any famous writers? What were they like? Was your experience anything like the Queen's? The appeal of books, according to the Queen, lay in their indifference: there is something undeferring about literature, she says. Books do not care who reads them or whether one read them or not. All readers are equal, herself included. Do you agree? Have you ever felt unequal to a book? Superior to one? When the Queen first meets the man in the book mobile, she refers to herself as a pensioner – this is clearly a joke. 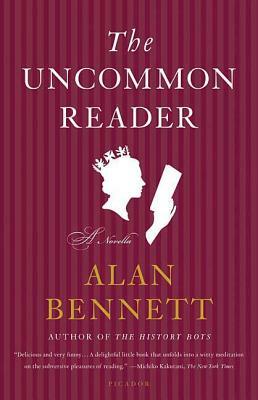 Talk about how Alan Bennett gives voice to the Queen and draws humor from her. How had your feelings for this seemingly inaccessible figure changed by book's end? Why is Norman fond of Cecil Beaton, David Hockney and J.R. Ackerley, what do these three people have in common, besides being British artists and writers? The Queen finds that one book often lead to another; that doors opened wherever she turned ("the days weren't long enough for the reading she wanted to do"). Has The Uncommon Reader opened doors for you? Has it inspired or emboldened you to try a book you've been putting off. Proust, perhaps? When the Queen begins to ask her subjects what they are reading, she is usually met with a shrug (or the Bible, or Harry Potter). Are people intimidated by reading, or are they just lazy and dim? As the Queen reads, she grows less interested in her royal duties, and even her appearance (the "permutations" of her wardrobe) goes into decline. Is she becoming more normal, more common? How has reading endangered her ability to carry out her role as a focus for British identity and unity? Isn't that role just a little too much for anyone to shoulder? At first the Queen does not like Henry James's Portrait of a Lady ("oh, do get on! "), but she finds that reading is like a muscle that needs to be developed, and later she changes her mind about James. Have you ever had a similar experience, upon revisiting a challenging book? Would you consider reading The Uncommon Reader again, in order to glean further nuance from its pages?